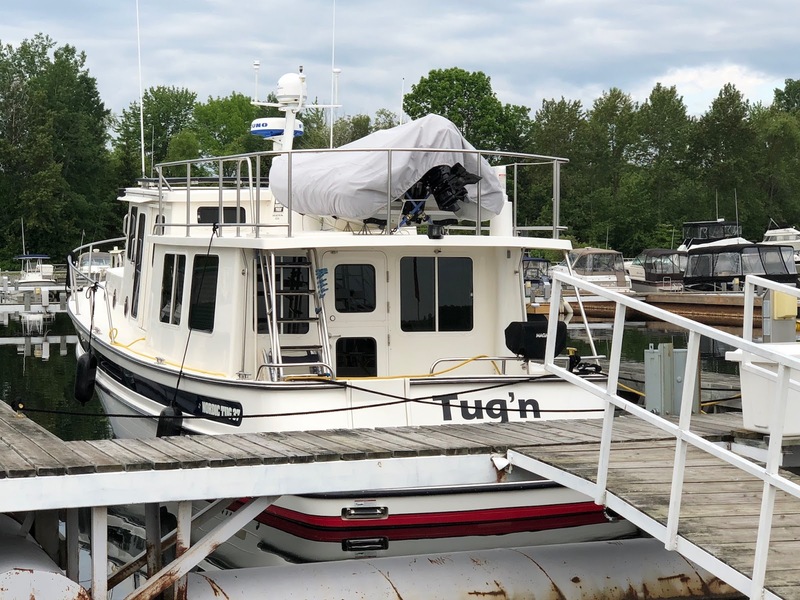 After a busy spring, we finally got Tug’n loaded up, launched on June 4th and all equipment checked out by June 10th. 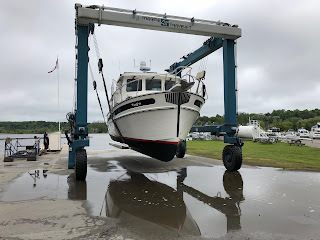 We officially left the dock on Monday June 11th for our summer 2018 cruising. This summer’s plans are mostly unplanned. 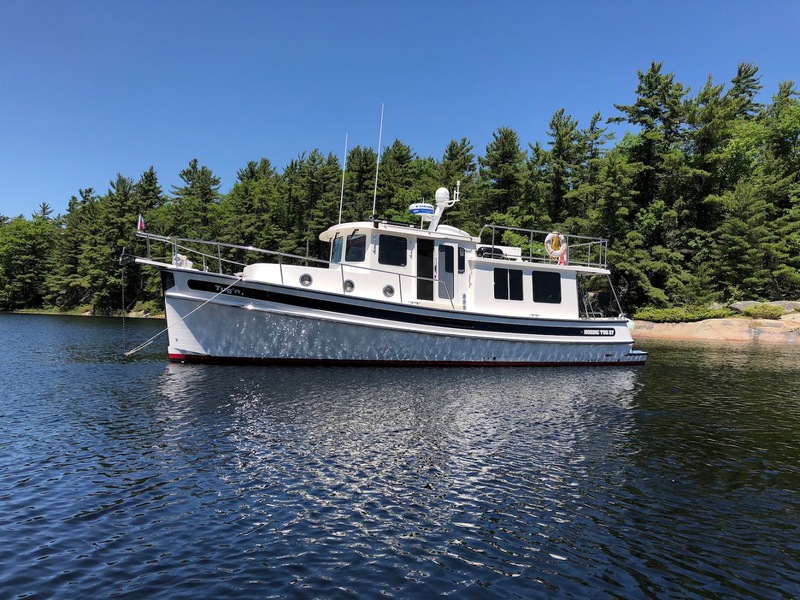 We’ll be on Georgian Bay between our home port in Penetanguishene and the Bad River (North East corner of Georgian Bay) until mid July. Then we return home for the wedding of our niece. 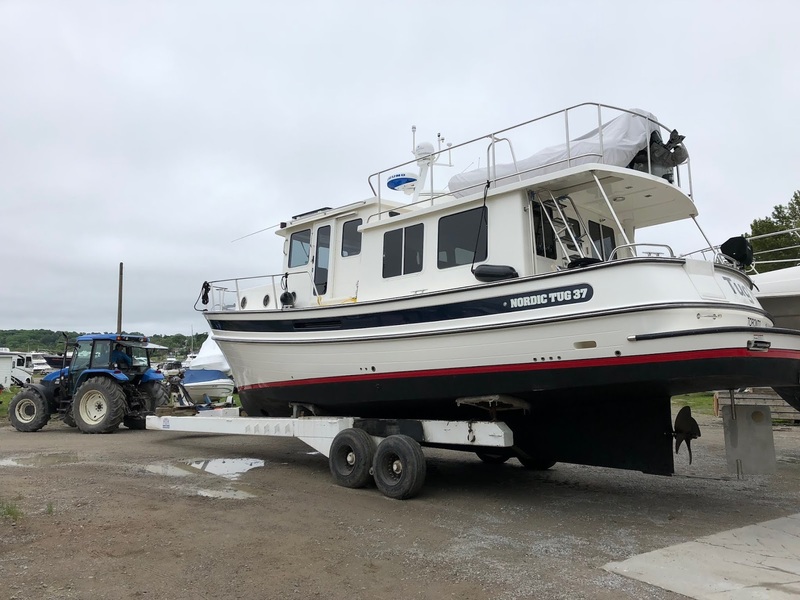 After that, we’ll head up to the North Channel, between Manitoulin Island and the north shore of Lake Huron and cruise that area until early September. 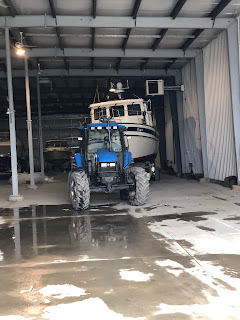 Every spring, preparing the boat involves some usual chores, such as connecting batteries, checking / changing engine impellers, new fuel filters (I do the oil change and oil filter change in the fall), fill the water tank and start up the plumbing systems, as well as turning on and checking every piece of equipment (generator, heater/AC units, propane stove/cooktop, fridge, freezer, electronics etc. One also has to re-learn how to use the electronics and the older one gets, the more re-learning is involved. 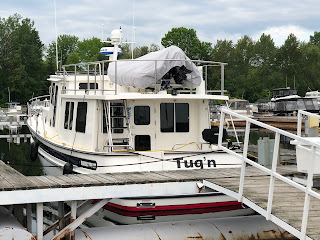 Launch produced some anxiety, as last fall, I’d removed our rudder & rudder seal, propeller, shaft, shaft seal and shaft coupler. The shaft, coupler and propeller were all checked for trueness and a new shaft seal and rudder seal were installed when it was all re-assembled. My anxiety came from overthinking the possibility water leaks from the rudder seal or shaft seal, but to my great relief, all was fine. Some of these tasks take a few moments and others turn into a project. 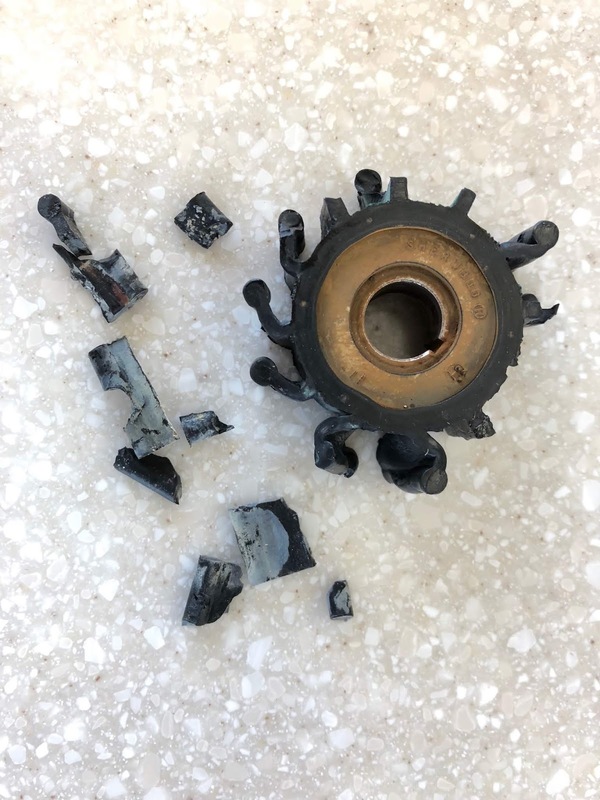 Our generator impeller change turned into a project as numerous vanes from the old impeller had broken off an each one had to be retrieved from the heat exchanger, otherwise the water flow would be impeded, possibly resulting in overheating. Upon firing up our electronics, several functions were not working and after several hours of trying to resolve the issues I called the Furuno technical help number for assistance. After about an hour on the phone with the technician, we discovered a cable from my chart plotter to the NMEA2000 backbone was loose causing selected data to not be present for other instruments to “see”. Alas, it was an embarrassing moment. 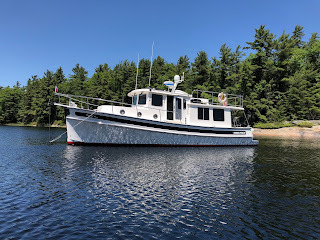 Monday involved a short cruise out to a local favourite anchorage at the north end of Bone Island, called Hockey Stick. The first night anchoring out allows us to ensure the anchoring systems all operate properly and that the house bank of batteries handles the load of all our 12 volt systems satisfactorily. Thankfully, we were blessed with wonderful weather, calm water and all systems worked perfectly. There were very few boats about and we enjoyed a lovely afternoon and overnight in Hockey Stick. Blog postings won’t be very plentiful this summer. 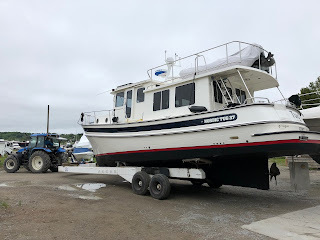 For the next 10 days or so we plan on making our way north to the Bad River and with a fair amount of luck, we may catch some pickerel (Walleye) that this area is/was famous for. Best wishes to all. Fair winds and calm seas. case of impellers! (Grin) How as Furuno tech support to deal with?